I’m in the process of creating the new Yordie’s Zen Garden. It will be on a quarter of a homestead sim, so I will be reeling in the number of features a lot. 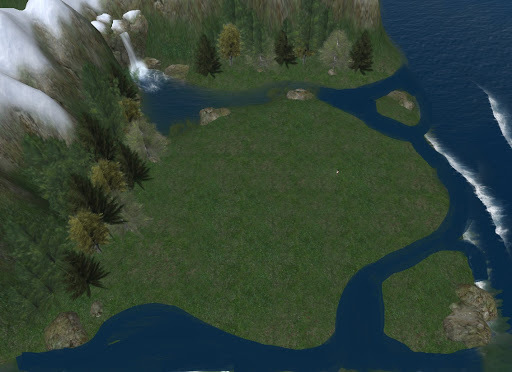 Here are a couple views of the sim and the terraforming plan for the sim. Actually, I’m quite a bit farther along than the planning stage. The plot is surrounded by a tall mountain range and has a built-in waterfall which I plan to keep. This is a modified photo that shows the terraforming changes I have planned. I’m thinking seriously about putting the tea house on that little island in the bottom right, but also considering Taka’s pavilion or perhaps a fire pit surrounded by logs. I expect to have a formal opening of the garden in a couple weeks. I’m feeling the pinch of having 1/4th of the prims I had at Yemple. Otoh, as Taka points out, I don’t have to waste many prims just trying to hide the ugliness of the mainland. Also, the skies won’t look like a garbage dump like most mainland skies when you set your Draw Distance to 256 or higher. I have to admit, I resisted the idea of moving to a homestead but with double the space and no ugliness to hide, having only half the prims isn’t so bad. This entry was posted in Journal and tagged Creating & Building, Second Life. Bookmark the permalink. This sounds like such a cool project. I have been wondering if I should have a homestead too, but I had such a great deal on the land I have now, and my friends live close, so it will take a while for me to want to move. I am looking forward to seeing how this project developes. Thanks for the comment!